As I mentioned in my previous review of Surdyk’s Flights at MSP, there are good and bad airports for layovers, at least if you are looking for good dining options. And unfortunately, SEA seems to be perpetually locked sometime in the mid-1990s when it comes to airport dining. Aside from a number of Starbucks that would be considered implausibly high in most other places (I passed three just walking from my gate back to security, this is Seattle, after all! ), aside from Ivar’s Seafood Bar, the options at SEA mostly involve… Sbarro and McDonald’s (the latter being a fairly recent addition). But there’s actually a good, non-obvious option at SEA, at least if you’ve got a layover of at least two hours: Leave the airport! In a mere five minute walk from any gates but the N/S concourses (which have the little tramway connecting them to the rest of the airport), you can not only be back through security, but outside of the airport, and in another 5 minutes of walking, you can be off the airport entirely, and sitting in the warm comfort of 13 Coins. Seriously, it’s just off the airport grounds (as an aside, I didn’t realize until now that the surrounding municipality is actually called SeaTac, like the informal name for the airport), and a shorter walk than many of the gates. So if you have 2 hours or more layover, you’ve got plenty of time to wander over to 13 Coins for a meal and get back in plenty of time for your flight. As far as what sort of place 13 Coins is… It’s kind of a funky place. 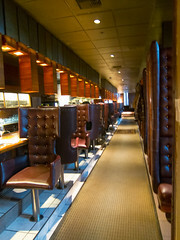 The original 13 Coins is in Seattle proper, but both locations are actually quite similar. 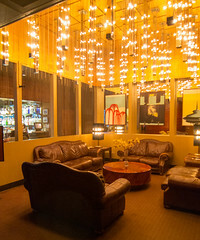 The original opened in 1967, and since then has been serving up a menu that’s a rather funky mix of upscale Italian, high-end steaks, and, well, diner food, and serving them up 24/7. If it weren’t for the decor, I’d call them a 24 hour diner… but that’s not the decor. The decor is…. 1967 supper club. Seriously, walking into 13 coins is like walking into the 1960s, or at least your stuffed-leather, dim light, and white-clad waiter stereotypical vision thereof. About the only thing missing is cigarette smoke. Looking over the menu, despite the environs, I was drawn in by the idea of a sandwich, and ordered a Reuben. The result was quite impressive. 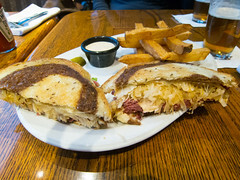 These days, a typical Reuben is generally a few layers of corned beef (usually Boars Head, if you are lucky), some tired kraut, and some tired and worn thousand island dressing, on some rye bread. Well, on the surface, 13 Coins wasn’t that different, but biting into it, this was a solid sandwich. The rye bread was nicely grilled up and crispy without being overly greasy. 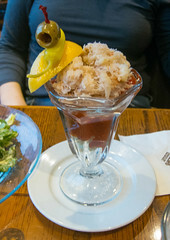 The kraut was a high quality, crunchy kraut. The corned was obviously an in-house product, and a lot juicier and meatier than your normal fare. Add in some of their house potatoes (an upgrade I requested from their more usual fries), and the result was a pleasant dinner in pleasant surroundings, escaping the airport hustle and bustle. Carol did quite as well, too, with a simple light dinner of a dungeness crab cocktail: an ample potion of flaky cold dungeness crab, served up with just a bit of crunchy celery and a very flavorful and horse-radishey cocktail sauce, and this was a simple but well-execute dish. 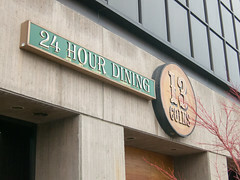 Overall, 13 Coins is a bit of an odd place, but between the funky time-capsule nature of the decor and the distinct improvement in both food and ambiance over the airport, and 13 Coins is worth a try if you’ve got a long layover or delay at SEA.